Performances begin at 7:30 p.m. on Thursday, Friday, and Saturday, February 28 through March 2, and at 2 p.m. on Sunday, March 3. Tickets, available via online vendor Etix, are $5 for students, $10 for seniors (60-plus), and $15 for adults. Due to mature content and gunshots — albeit blanks — the show isn’t recommended for children younger than 12. “Curtains” is a play within a play. Set in 1959, it’s opening night of a new musical at Boston’s Colonial Theatre when the show’s lead actress, an aging diva with no discernible talent, is murdered. Everyone, cast and crew, is a suspect, and the detective sent to investigate the crime just happens to be an aspiring musical thespian. It’s the first time anyone at Lynchburg has worked on this musical and likely the first time it’s been staged in Central Virginia. “It’s a new venture for all of us,” theatre professor and director Jeff Wittman said of the play, which won eight Tony awards during its Broadway run. There’s no shortage of comedy in “Curtains,” which is chockablock with wacky characters. In addition to the murder victim, who is described as a “diva who has no right to be one,” there’s the acrimonious mother-daughter duo of Carmen and Bambi. Brooke Bosiger ’19 plays Carmen. “She’s a very dominant and brassy character and the producer of the show within the show,” Bosiger, an English and theatre major, said. “She always speaks her mind and does everything in her power to make the show as great as it can be. Ellee Evans ’19 plays Carmen’s daughter, who changed her name from Elaine to Bambi because in the Disney movie Bambi’s mother is killed by hunters. This says a lot about Bambi and the relationship she has with her mother. “Joanie is very professional and keeps her cast in line,” Topping said. “I’ve found that this character is a bit difficult for me because I’m used to playing very farcical, slapstick characters. Joanie is an older woman who is incredibly put together. It’s been a challenge to add age to my mannerisms. 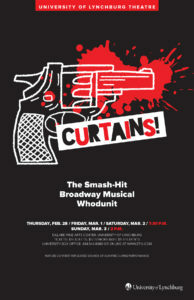 The cast of “Curtains” also includes actors from the surrounding theatre community, among them Bill Bodine ’78, ’89 MAd. “It’s a good thing, when appropriate, to bring in guest artists to work with our students,” Wittman said. “This happens occasionally with older, more mature roles. Such is the case with Bill, an alum and no stranger to our stage, having performed when he was a student here and now in the present. University of Lynchburg students are working on the technical side of the production, too — lighting design, set construction, costuming, etc. For theatre major Alex Gancedo ’19, who plans to pursue a career in lighting design, working on “Curtains” and other Lynchburg shows has been good experience and good for her resume. This is the second year that Kailee Weiman ’19 has worked on costumes for Lynchburg’s theatre productions. Weiman, who also plays murder victim Jessica Cranshaw in “Curtains,” said costuming wasn’t something she planned to do initially, but something she’s developed an affinity for. Over the final week of winter break, the cast of 22, along with three students from the stage management team, participated in a five-day musical theatre boot camp aimed at jump starting rehearsals and boosting camaraderie. Sometimes, they worked from 9 a.m. to 9 p.m.